Awhile back, I created the idea of Single Minded to talk briefly about the books of the week. As we continue to build the site here in 2018, we're working to bring it back. Here's my thoughts on some of the things I read that came out on May 30th, 2018. Let's see if we agree! 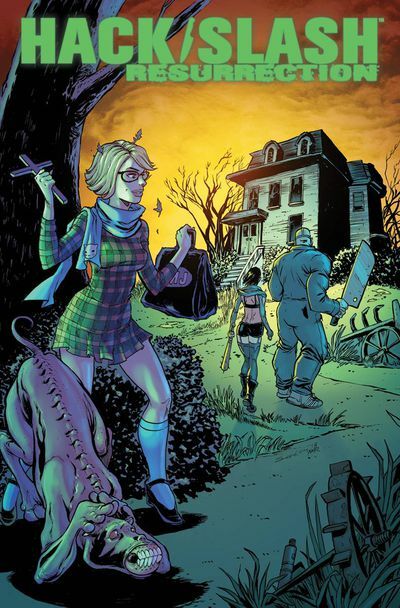 Cassie and Vlad get recruited by the investigators Cat and Dog to ride shotgun on a haunted house investigation led by a strange husband and wife team. When things go inevitably south, Cassie and company face a different kind of horror from the usual murders they deal with in a comic that was the highlight of my reading week. As I wrote in our preview column, Tini Howard understands these characters in a way that's extremely rare. Unlike when a host of creators took the reigns of some of Liefeld's properties (including Tim Seeley, the co-created of Hack/Slash), Howard isn't radically re-inventing Cassie. She's picking right up where the old series left off, without skipping a beat. It's really incredible. Vlad's naive comments at the end could have wrapped up any of Tim's issues and fit right in. Additionally, she gets the idea that this series is both a loving homage--and a nose tweak--to its inspirations. And this one plays the demonic haunted house tropes to the hilt, all with the signature sexual-but-not-exploitative vibe that attracted me to this series in the first place. Cassie's had a lot of artists over the years, but I really dig Celor's take. The artist works in the same angular vein of Matteo Scalera, allowing for some great creature work--and of course, Dog's cute creepiness--and a way for the characters to be exaggerated just enough to skip realism for effect. His facial expressions are really emotive, helping Howard's dialog zing out of the page, and Rusell's coloring meshes well with the linework. I'm really hoping this series gets to last awhile, and this issue is a good jumping on point for a new reader. If you've been thinking about this one--especially if you like Tini's other comics--I'm urging you to give this one a try. Livewire's had enough and if the world won't listen to her, she'll make them pay. The problem is that no matter how powerful she and her allies are, the US, UK, and other governments have assets of their own. Things are about to reach a breaking point in the opening salvo of the second Harbinger War, and it doesn't look good for anyone! 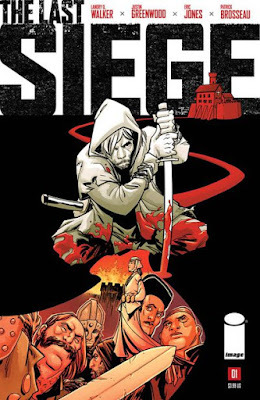 This is a rare chance for me to feel like a casual comic book reader, and I really enjoyed it. While I know the Valiant Universe characters, I haven't followed everything closely, sticking more to the Archer and Armstrong/Quantum and Woody/Faith side of things. So part of reading this was seeing if Kindt could keep me interested. Shocking no one, he totally did. Though sometimes the characters get a little wordier than they should, and there's references that they'd be unlikely to say to each other, like "Remember that time you used my armor? ", I appreciated that Kindt gets anyone new (like me!) up to speed on what's going, on, why Livewire has gone full-on Magneto, and generally sets the stage for what's to come--all while still telling an interesting story within the context of this single issue. I owe reading this one to a Women Write on Comics review of the issue, which was not particularly positive, but intrigued me enough to give it a shot. Claire is the one who nailed the "similar to X-Men" vibe, and she's spot on, though I'm less inclined to think Livewire comes off badly--I see it more as "two wrongs aren't going to make a right"--we'll see if her initial impression is correct. My main concern is that I don't want them to harm or darken Faith, who has a cameo here. Giorello's linework here is okay, but nothing special. Scenes that could have a lot of menace, like Livewire facing off against X-O Manowar in a redwood forest or the not-quite-right nature of Blootshot or even how the military prepares to take out the psi-powered kids, feel rather pedestrian. I'm also pretty sure there's no inks here, and the poor colorist has to make up for that. 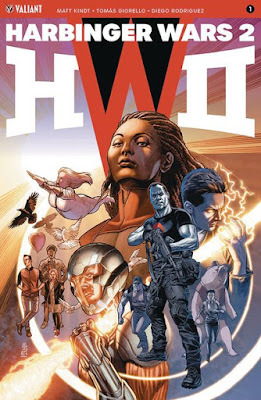 It's disappointing that Valiant didn't strive to get a more dynamic artist for this one. Overall, though, there's enough here to keep me going. I wonder how this worked or didn't for more invested fans? A young woman goes to a bar to see a new friend's band, and they really rock! They're also really dysfunctional, and soon her friend is tossed out. What to do? Form a new band, of course. But the old band leader seems really creepy, as this new series makes its tepid debut. 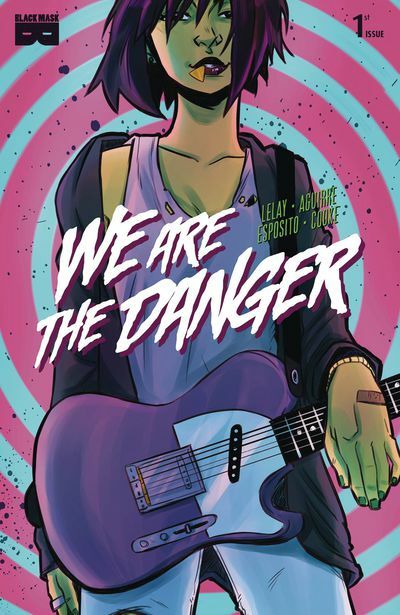 There's nothing wrong with We Are the Danger per se, but at least in this first issue, it doesn't do anything we haven't seen before. Bands with rivalries and close ties are plentiful, with Nana being arguably the best of these, but it includes to some degree Scott Pilgrim, a Black Canary series (of all things) and others. And the characters--again, so far--don't feel fleshed out enough. Why would we care about this particular band? Where is the quirk or original twist? That might show up later, but for a weekly book in a similar vein that Boom! covers so well with things like Giant Days or Backstagers or Dodge City (all of which had distinct, interesting characters right from the start), you can't delay. It doesn't help that Lelay's art lacks punch. He does a few cool things, like the giant mix tape layout, but overall, there's nothing in the panels that helps this one stand out. In fact, standing is the problem---I could draw lines from the top of a page to the bottom and likely hit the spines of several characters. There's very little action or movement, and even solid colors and the occasional dagger eyes can't rescue the stiff feel. I'm not seeing the danger of the title at all. 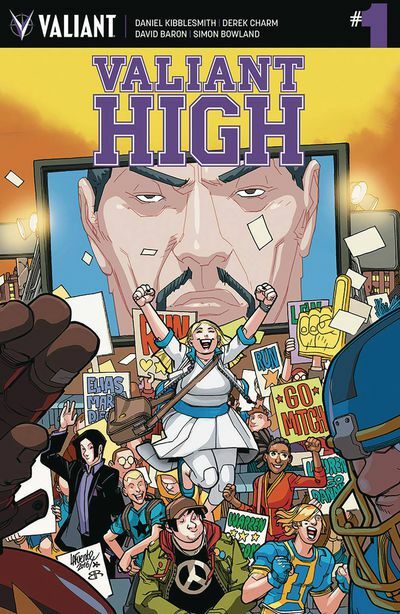 What if all the major Valiant characters went to the same special high school, taught by a few of the elders of Valiant's universe, like Dr. Mirage and Bloodspot? Hijinks of course, especially when Ninjak shows up and decides to throw a monkey wrench into the careful cliques of the characters. It's serious people shifted into shojo manga, and how well that works for you will depend on how much you're into the concept. 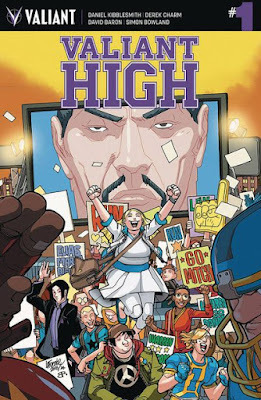 Using the same OEL standards we've seen for comics like Blue Monday, Kibblesmith tries to think like a teenager who just wants school to be finished. Livewire is our focal character, and because of that, I have to admit, I would have preferred seeing how a woman would have written this. It feels a little too much like how Minx didn't use enough women as creators. It's clear the concept is basically "What if we aged up Tiny Titans?" and again, whether or not this is of any interest to you will be based on you liking that sort of thing. I do, so this worked for me, but I imagine it's a pretty niche audience. Derek Charm's art design evokes the look of teen-based books from other publishers while still capturing the characters extremely well and making them recognizable. And I love the bright colors Baron uses, especially since I tend to find Valiant books a little muddy sometimes. Originally online only, it's nice to see this one in print and I hope it finds its audience. I think at least some of our readers should dig this. Even Mega-City 1 has failed projects, in this case literally. 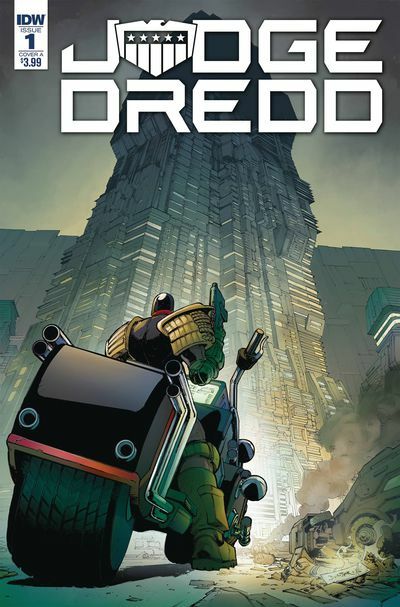 When Judge Beeny goes missing at one of the outer blocks, Judge Dredd is called in to find her--and finds a mutant uprising that threatens the entire stability of the law. IDW's Judge Dredd books are best when they don't try to be a story that might get told in 2000AD and/or involve Ulises Farinas. It always feels to me that since it's not entirely their character, the American side of this team has to be careful not to risk too much. That's a major hamstring in a character where doing the worst possible thing often makes for the best stories. With that in mind, it's hard to believe that Judge Beeny is in any real danger here, because I can't imagine IDW being allowed to permanently harm a well-known Judge. Which is a shame, because it undercuts a seriously awful situation for Dredd. He's disconnected from aid, extremely overwhelmed, and up against mutants who seem to have a solid plan, taking advantage of the way Mega-City 1 ignores the plight of those who aren't well-off. Russell hits on that, which I liked, but it feels like that's going to be buried under a major slugfest. We'll see, though. The structure of the trap is really awesome, but I'm not sure Russell quite gets Dredd, writing him with more intentional humor than I think works well. Unfortunately, I'm not a big fan of Dunbar's art here. I often found myself flipping back and forth to follow the action, as in certain areas (such as the football bust opening scene) I couldn't see how the panels and pages lined up. It was like a needed transitional panel was edited out somewhere along the line for space. There's also almost no variety in the panels, with 5-grids used over and over again. It really hurts the flow of the story, when combined with a tendency to show characters as small figures against looming buildings or scenery. Overall, this wasn't bad, but unless it picks up next month, I'll probably stop reading. It's a shame because there's some cool stuff in here, it's just buried in often confusing art. A teen girl's fate is being decided by awful men in the shadow of a seemingly lost war. When her cruel spouse to be attacks a traveler in an inn, however, things might change quickly in this series that works within the same framework of other stories but still has a promising direction. Last but not least in the column was another book I selected for a preview yesterday. I'm a big fan of Justin Greenwood's art, and he looks spectacular here. As I wrote in the preview, his thick lines mesh perfectly with the rough tavern battle and general grime. When his figures fight, they almost look like they are really smashing bodies together! And I will also call attention again to the way he portrays the rain in this issue. But while art can carry a comic, Greenwood doesn't have to--Walker's script finds a sweet spot between extensive exposition and too few details, giving us just what we need to understand the shock of the characters as we get the big reveal on the final pages. His characters are speaking a little more modern than I'd like for the setting, but that's a style that works for most people and I can roll with it in exchange for a good plot and outstanding art. Again, highly recommended for your pull list. That's my week! How was yours, reader? Feel free to chime in on Twitter, where you can find me @rob_mcmonigal. Let's talk comics!